New management has given the shop a renovation and a new vigour to provide great relaxation and therapeutic massage. We look forward to old customers returning, and curious new customers dropping in to try us out. Lily and her skilful team are keen to meet you both. Trading Hours Open 7 days 10am to 8:30pm (8pm last appointment). Speciality Providing specialist Asian trained masseuses for both therapeutic and full-body relaxation oil massage. Premises Comfortable and spacious rooms. Waiting room, toilet and air-conditioning provided. 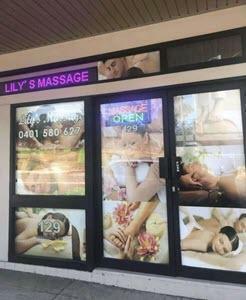 Looking for best in therapeutic and relaxation massage in Haberfield, Croydon, Summer Hill, Ashfield? Call 0401 580 627 Now!